Have you witnessed the blood bath going on out there in regard to pricing? 20% of Americans now subscribe to Amazon Prime. In other words, these customers ... representing more than 20,000,000 households ... let that one sink in ... are willing to pre-pay for shipping and handling a year in advance, with no guarantee they will even get maximum utility out of their investment. I'll say it again ... these customers pre-pay for shipping without getting any products shipped to them. That's what a catastrophe looks like. 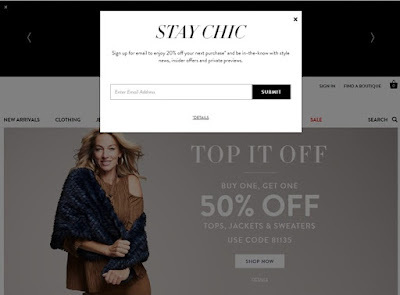 It's late October, one of the busier shopping periods of the year, and the home page is BEGGING the customer to buy something ... 50% off one item if you buy one item - get discounts to sign up for email ... just a complete meltdown, don't you think? Chico's isn't alone, of course. A review of any catalog website illustrates the desperation that has crept into non-Amazon commerce. I have analyzed full price and sale price / promotional behavior for the past ten years, more than 100 times. 50% off is toxic. TOXIC. The future of a "brand" is poisoned by today's promotional strategy. Customers who are acquired via discounts/promotions are much less likely to pay full price in the future than are customers acquired via full price. Customers who convert from full price purchases to discount/promotion purchases are much less likely to pay full price in the future. This is bad, folks. I'm sure you have analyzed the issue as well ... right ... RIGHT? And no, I don't mean you analyzed an A/B test with 20% off vs. 40% off. You actively simulate long-term customer value, and you know the results inside-and-out, right? It's bad because when merchandising tactics are fixed next year, you'll have the right merchandise and the WRONG customer. Your customer base will expect discounts/promotions again, and won't buy unless you dazzle the customer ... and the deeper the promotion this year, the more the customer will expect deep discounts next year. It takes 3-5 years to move a customer from a promotional rhythm to a full-price cadence. Most Executives don't have the patience to pull that off and deal with tepid top-line sales in the short-term. Remember, discounts/promotions are largely a function of inventory position. If your business fails to meet budgeted sales levels by 20%, you are going to deal with an inventory situation not unlike nuclear winter. You have to purge the system of the rotting tomatoes sitting on the shelves. Historically it was important to make sure that the customer was happy. You didn't want a customer to visit the widget page and realize that widgets weren't available. So inventory levels were tied to budgeted sales forecasts, hoping that sales would hit the budget and all customers would be happy. Here's the problem. Let's say you are in a full-price environment, and you hit budgeted sales. Say you forecast to sell 10,000 widgets at $49.99 each, with a cost of goods of $19.99 each. Now, let's say that business is not hitting budgeted levels ... business is off by 10%. Your Management Team decides to blow through inventory by offering 20% off. The dynamics change. Had your Inventory Team "under-bought" by 10%, you wouldn't have had to discount. The story changes (again), if you had under-bought inventory. In other words, you'd sell through your inventory, you wouldn't have a need to discount to move inventory, and you take home $270,000 margin. I know, I know ... if sales hit budgeted levels, then you lose out on $30,000 of margin. But if business is 10% below forecast, you gain $70,000 of margin. There are three benefits to this strategy. You avoid training customers to expect discounts and promotions, protecting the future of your business. You protect gross margin dollars. You create urgency. If the customer does not buy today, the item may not be available next week. As a result, the customer is motivated to buy RIGHT NOW. You want to train your customer to buy RIGHT NOW, don't you? There is one drawback to this strategy. If business is on plan or above plan, your inventory team has to hustle like there is no tomorrow or sales will not be maximized. Because of the one drawback, almost nobody employs this strategy. In modern cataloging, where co-op response is awful (yes, it is awful, face up to it) and sales seldom exceed expectations by more than 10%, the three benefits greatly outweigh the one drawback. Urgency is the biggest benefit. The fast fashion folks figured this out. By having virtually nothing in stock, fast fashion folks demand that you buy something RIGHT NOW or it won't be there tomorrow. Urgency results in store traffic, high conversion rates, and constant "engagement". Meanwhile catalogers follow a vendor-centric playbook demanding full integration across channels and endless inventory depth ... a woeful strategy that results in non-stop overstocked positions that demand 40% off plus free shipping ... a strategy that fully devalues the catalog brand. The path to pricing integrity isn't "competing with Amazon". That battle has been lost. The battle is with other catalog brands. Create urgency by not requiring an inventory position that aligns with your sales plan. You won't have to discount, and you will create urgency. In modern cataloging, urgency is a key demand driver. Take advantage! You are no longer competing against Amazon. They won a decade ago. Catalogers lost. The battle now is to take market share from weak catalogers. You don't want to be a weak cataloger, do you? Good! Then it's time to change. During the past two weeks, I shared a lot of information about company success. Catalogers didn't seem to #engage with the content ... opt-outs ... if I shared stuff about a retail brand the emails weren't opened ... if I shared something about Williams Sonoma, oh, then the catalog audience liked it. If you were frustrated with what I shared (#notactionable), then go click on this (click here) and think about what your version of this is, ok? This week, I'm going to focus on stuff that catalogers can do to improve business performance. They have robust new customer acquisition programs that generate large numbers of new customers at a very low cost. They have a robust new merchandise development program, yielding high numbers of winning new items. They maintain pricing integrity, often through maintaining low/scarce inventory levels. They have a unique voice. For the rest of this week, we'll discuss how catalogers intersect with each of the four things that great companies do well. Homework assignment: Grade your catalog brand (or if you aren't a cataloger, grade your brand) based on each of the four topics above. Give your brand an A/B/C/D/F grade on each of the four topics. Hint - I will grade catalogers this week. Omnichannel folks and Catalog-centric leaders love to point to Williams-Sonoma as a shining beacon of business productivity. But wouldn't it be good to know if Williams-Sonoma financial data actually looked good? 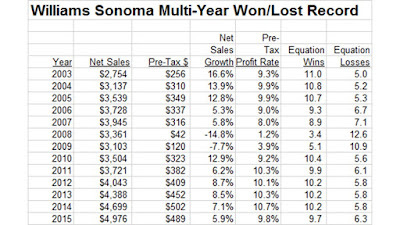 We see a highly successful business that eroded for four straight years ... then The Great Recession hit and Williams-Sonoma bottomed out at 3-13 in 2008. Wow. It only took two years to rebuild the business. 10-6, 10-6, 10-6, 10-6, 10-6, 10-6. That's six straight years of playoff-caliber performance. That's impressive stuff, my friends! Pre-tax profit is generally around 10%, sales growth is generally around 7% - 8%. But there is a bit of a wobble in 2015, isn't there? 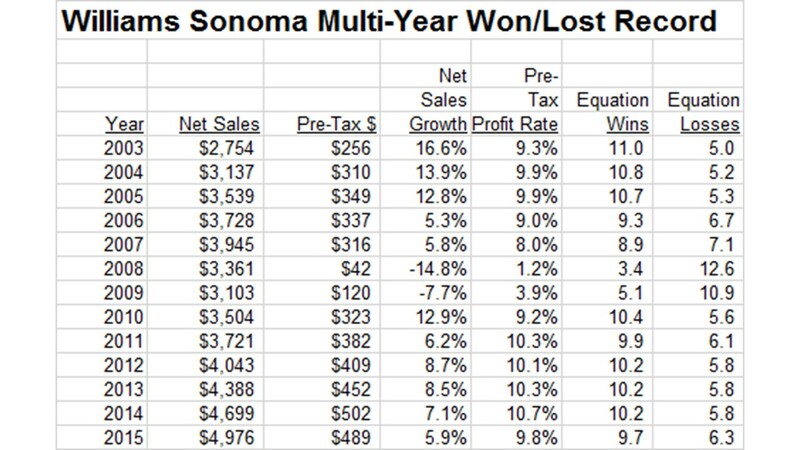 So Williams-Sonoma is in danger of dipping toward 8-8 if Q4 isn't very good ... dip below that, and it's time to start thinking about a rebuilding project. Kohl's is one of those businesses that gets positive press for online growth. Of course, online growth isn't what winning is all about, is it? Online growth is comparable to an NFL having a good downfield passing game ... flashy stuff and good for highlights, no doubt ... but you need to be strong in passing and running and defense and special teams to "win". What does Kohl's look like, on an overall basis? 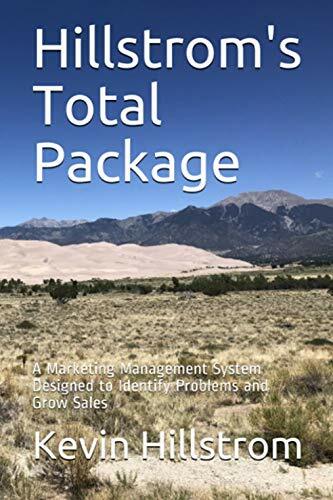 This is a business that is performing at a very average level ... mostly because sales are not growing, but Management is able to squeeze profit out of the business. That's changing in the past five years, as profit continues to decline each year. 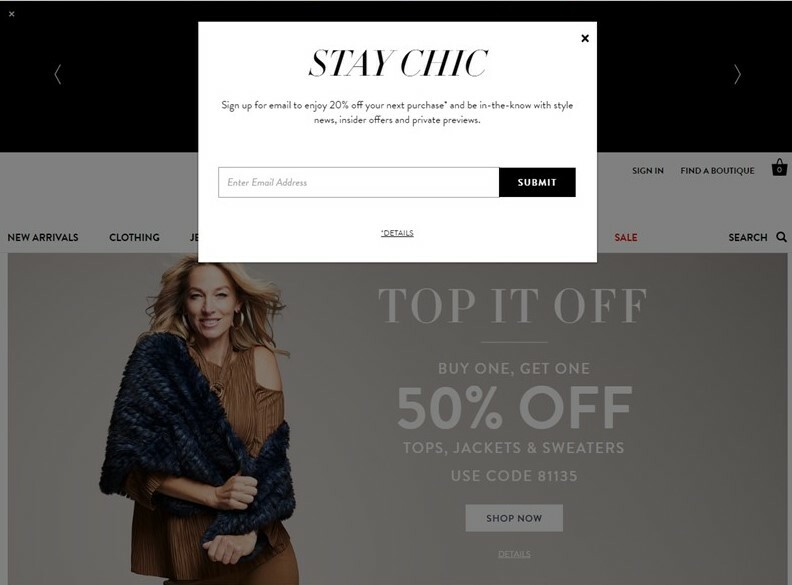 So yes, go ahead and cheer Kohl's on as they grow their online business. The digital folks are happy with performance. But Kohl's has not posted a Playoff-Caliber year since 2010 (maybe 2011), and is flirting with a potential losing season in 2016. Once a brand posts a losing season, it is not uncommon to watch the birth of a rebuilding process. 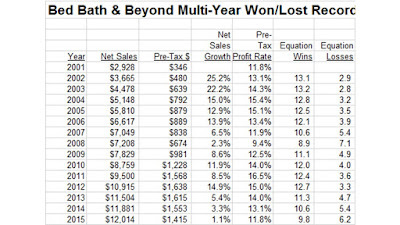 One of our Twitter followers asked to see how Bed, Bath & Beyond performed in recent years, given their strategic direction to slowly wean themselves from discounts/coupons. 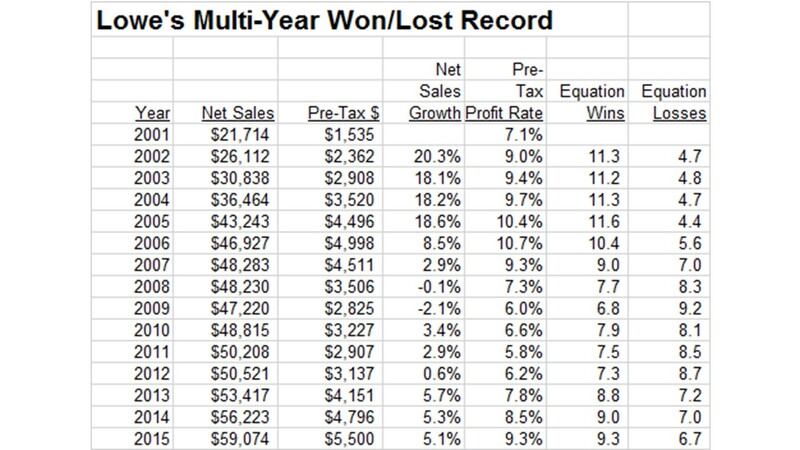 Remember the framework ... net sales growth and pre-tax profit rates are converted into NFL won/lost records. This allows us to compare brands along metrics that sports fans are used to seeing. Championship Caliber = 12-4 or better. Playoff Caliber = 10-6 or 11-5. Average Performance = 7-9 or 8-8 or 9-7. Time to Rebuild = 6-10 or worse. 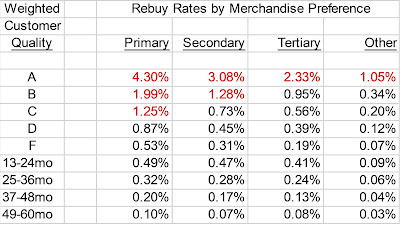 Here's the data for Bed, Bath & Beyond. But what do you see happening in the past four years? 13-3 to 11-5 to 11-5 to 10-6. This business is slowly heading toward rebuild status - unless something changes soon. With the noticeable exception of the financial collapse, last year's performance was the worst of the past fourteen years. This week, we'll plug through a series of retail businesses that are legally required to publish their financial information ... you'll be able to see what "winning" looks like. Below, I've outlined the results for Home Depot. Tell me if you can see where the housing bubble popped. And, tell me if you think this is a well-run business or not. That's not bad, it is? 7 straight years of improved performance. Look at how long it takes to rebuild a business after a catastrophe. Three straight years of 6-10 records at the peak of the financial crisis are then offset by 8-8 and 9-7 and 10-6 and 10-6 and 11-5 and finally 11-5. It takes a long time to dig out from a financial hole, doesn't it? ... then tell the business leader that the business the leader manages is going through a "Losing Season". Last Year Net Sales = $75,000,000. This Year Net Sales = $77,000,000. This Year Pre-Tax Profit Percentage = 4.1%. Using my equation, this equates to a 7-9 season. This is a very common story in the world of catalog marketing. Several years of tepid co-op performance stunt long-term growth ... and tepid co-op performance leads to an expensive cost-per-new-customer and ultimately a low pre-tax profit percentage. The cataloger is too-married to the co-ops to get out from under the relationship ... and the relationship yields a 7-9 record ... and that's when business is good!! In other words, the strategy is ultimately going to get the CEO fired ... just give it time. You should hear what happens when I tell an Executive that they're performing at a 7-9 level. "That can't be right! Sales grew! We're growing! We're winning." "Look, I'm going to get an 80% bonus this year. We're fine." "We're profitable. Lots of folks aren't profitable. Look at Sears, for instance." "We haven't posted 10% pre-tax profit since 1993 - Amazon won't let you post 10% pre-tax profit because they took away all of our pricing power. It's their fault." "Go back and re-score our business - we think we're an 11-5 team, and we think we have the metrics to convince you we are an 11-5 team. For instance, net promoter scores are high and customer engagement is high. Use modern metrics and you'll see that you are wrong." Nobody wants to hear that they are failing. But a 7-9 record is a failing record. Sure, you do some things well. But you do more things wrong. And I get the Sears argument. So I scored Sears for the past decade. Are you ready for this? Grab a seat. So, yes, your business isn't like Sears. But your business isn't like Nordstrom, either. During the past ten years, Nordstrom posted 9 winning records, 7 playoff-caliber performances, and 1 championship-caliber performance (2006). That's borderline excellence. An objective view of your business help set proper expectations. And for so many catalogers, we're rationalizing that 7-9 and 6-10 seasons are "good" seasons. They're not. Not even close. And we don't want to acknowledge what a 7-9 or 6-10 season means, because then we have to evaluate our role in producing a 7-9 or 6-10 season, and that's not much fun. I sit here at the Corporate Headquarters of MineThatData, catching up on industry news. Every day, there will be an article headline that makes no sense. "Six Ways To Turbocharge Your Instagram Strategy For Breakthrough Results, Number Six Will Stun You". Engage your audience with imagery. Offer a discount to tickle the buying bone. It's at this point that I bang my head against the purple walls that adorn the Corporate Headquarters of MineThatData. Lightly concussed, on-site medical staff determine if I have the strength required to read yet another article outlining Thought Leadership opportunities. Here's the thing. It is really, really hard to Rebuild a Business. Remember the won/lost data for Chico's, presented yesterday? When the business bottomed-out during The Great Recession, a new CEO was hired. It then took three years, yes, three years, to achieve a 10-6 record, a level I consider "playoff worthy" (sales growth was 11%, pre-tax profit was 6%). And once the business got to "the playoffs", the business began to fall apart. A new CEO was named in 2015, when the business suffered through a 5-11 season (sales fell by 1%, pre-tax profit was flat). In other words, you don't turbocharge a business with an Instagram strategy. You work your rear-end off on 1,493 tiny details that all work together to create steady improvements in key metrics like net sales and pre-tax profit percentage. How do you link together the 1,493 tiny details that all must work together so that your business can go from a 6-10 record to a 10-6 record? Discuss. Remember Chico's data from yesterday? I asked you to assign NFL number of wins/losses to each "season" from 2007 - 2015. How did you do? In 2007, net sales grew by 4.5%, and pre-tax profit was 5.2%. In 2008, net sales were -7.7%, and pre-tax profit was -1.2%. 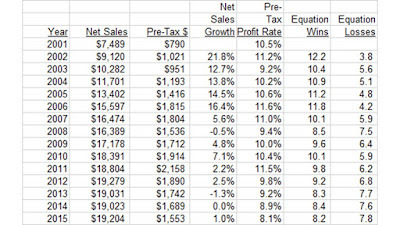 In 2009, net sales were +8.3%, and pre-tax profit was +4.1%. 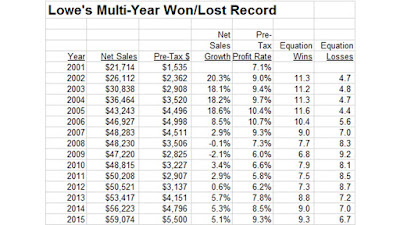 In 2010, net sales were +11.2%, and pre-tax profit was +6.1%. 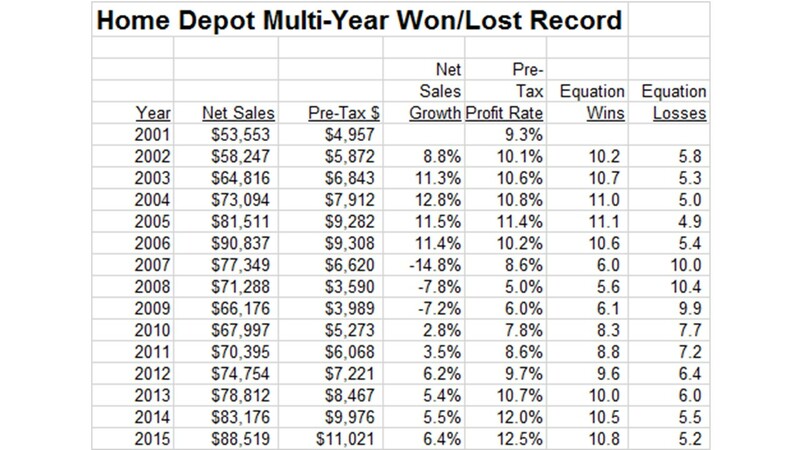 In 2011, net sales were +15.3%, and pre-tax profit was +6.4%. 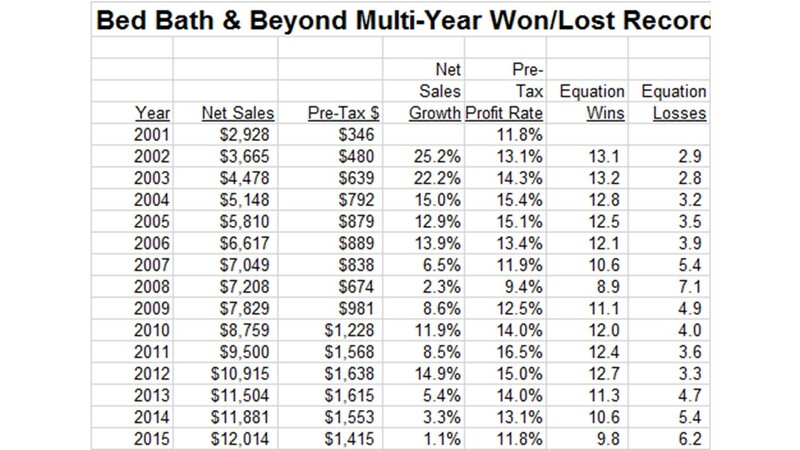 In 2012, net sales were +17.5%, and pre-tax profit was +7.0%. 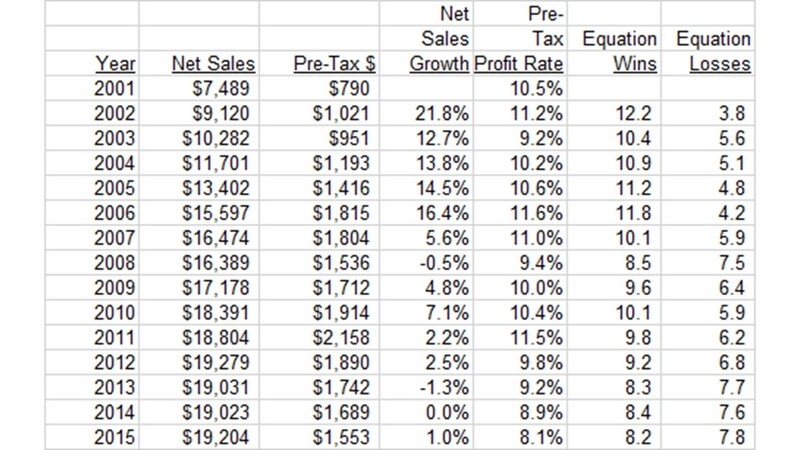 In 2013, net sales were +0.2%, and pre-tax profit was +2.5%. In 2014, net sales were +3.4%, and pre-tax profit was +2.4%. In 2015, net sales were -1.2%, and pre-tax profit was +0.1%. Ok, here's where we get a bit geeky - you can check out and go read about eight tips for a successful engagement strategy or some other nonsense if you don't want to spend 18 seconds hearing about the geeky equation. Step 1 = Measure the Net Sales Gain. Step 2 = Measure Pre-Tax Profit Percentage. 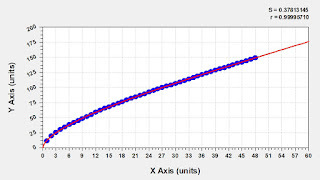 Step 3 = Calculate Logit = -0.877 + 3.829*(Net Sales Gain) + 10.944*(Pre-Tax Profit Rate). Step 4 = Calculate Winning Percentage = EXP(logit) / (1 + EXP(logit)). Step 5 = Calculate Wins = 16 * Winning Percentage. Step 6 = Calculate Losses = 16 - Wins. Are you ready for the results? Yes? Good! A Championship Caliber Year = 12-4 or better. A Playoff Caliber Year = 10-6 or better. CEO Could Get Fired Year = 6-10 or worse. You can see The Great Recession in 2008 - it's easy to see, isn't it? 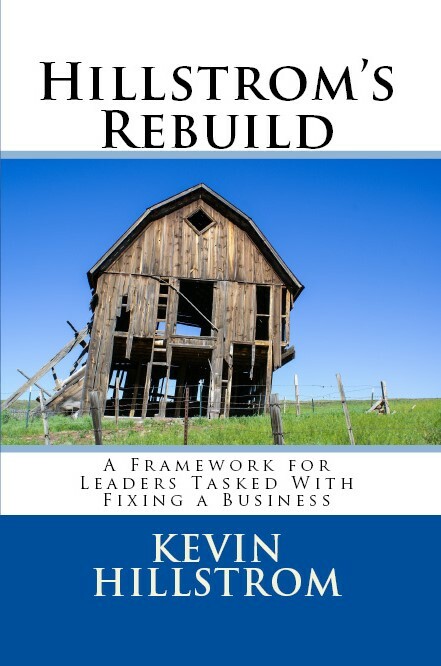 Then the business embarked on a "rebuilding project" - no different than an NFL team. A new CEO was hired in 2009, coming off of a 3-13 "season". The new CEO rebuilt the company ... from 3-13 to 8-8 to 9-7 to a pair of 10-6 seasons in 2011/2012. And then the wheels came off. In 2015, Chico's announced that a new CEO would be hired, and by late 2015, a new CEO was hired ... as the business finished up a 5-11 "season". How did the CEO perform (2009 - 2015 ... 7 years). 3 winning seasons in 7 years. Hired after a 3-13 year. Employment term ended during a 5-11 year. The methodology "works" for an apparel-centric retailer, don't you think? Did we not adequately reflect success at Chico's? Tell me what is easier to understand? Net Sales Gain = +3.4% and Pre-Tax Profit Rate = +2.4%. A NFL Won/Lost Record = 6-10 (6 wins, 10 losses). Now, this equation isn't going to work for discount retailers ... but it will work great for most catalog brands, e-commerce brands, and most retail brands. And if the equation translates geeky numbers into easy-to-understand wins and losses, then the equation should help us understand if a "brand" is truly succeeding or not, right? How Do You Know If A Business Is Winning? Early in my career, I worked for an accountant responsible for running a direct marketing department. Anytime I performed an analysis of customer behavior, the individual asked me a simple question. "How much profit do we generate because of the behavior?" After saying "I don't know" three or four times, I figured out that I was an idiot, and I'd go get the information that allowed me to calculate profit. Then, I'd present my numbers, and the accountant would ask me a simple question. "Are you sure that Finance gave you the right metrics, because something doesn't look right?" Eight times in ten, Finance made a mistake, or I made a mistake interpreting what the Finance team gave me. People would come out of these meetings in tears. I recall a circulation analyst being yelled at because the gross margin percentage was something like 45% when it should have been 45.5% ("don't you get it, we can mail more catalogs and generate more profit with a half-point of gross margin in our pocket, now go back and re-work everything and have it on my desk in two hours"). Some at Lands' End were obsessed with achieving 10% pre-tax profit. That was our holy grail. You might only achieve this level of profit once every five years, but that was what was considered "championship-level" performance. Bonus payouts maxed-out if we hit 10% pre-tax profit ... and garden-variety analysts earning $28,000 per year (hint - me) earned a bonus. Does your lowest paid salaried employee earn a bonus if your company achieves a decent level of pre-tax profit? Do you? For five years, every analysis and every discussion ultimately came back to profitability ... were our decisions causing customers to generate more profit? 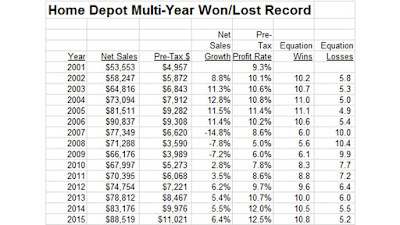 And we knew what "winning" was ... we were "winning" when we hit 10% pre-tax profit. Then I went to Eddie Bauer - "winning" at Eddie Bauer was a term called "Drive Sales Profitably". Our decisions had to increase sales, and had to increase profit. You had to do both. My SVP always said "you don't take profit percentage to the bank". While the CEO always harped on "Driving Sales Profitably", the rest of the culture liked to grow sales regardless of profit. Out came the discounts and promotions! Winning centered around growing the top line. And nobody could define what "winning" was ... every employee had a different interpretation of "winning". Not surprisingly, that business had a harder time achieving success. At Nordstrom, we were supposed to take care of the customer. For Management, bonus payouts clearly communicated what "winning" was ... grow sales, and grow profit as a percentage of sales. 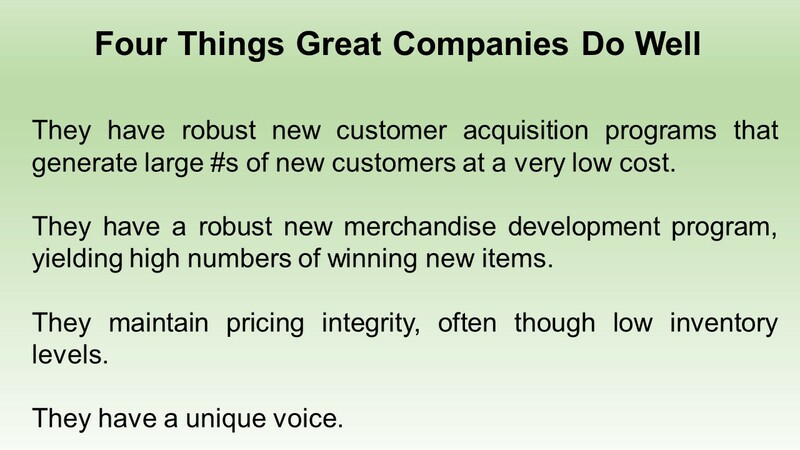 As long as customers could handle paying more at comparable gross margins, both metrics improved and everybody was happy. My consulting business is nearly ten years old. Can you believe that? And during that time, it has become more and more common for Analysts, Managers, Directors, Vice Presidents, CEOs and Owners to stare blankly when asked what "winning" means to them. Few people can tell me the percentage of sales that flow through to profit, and few people know how profitable their business is. In the half-generation I've been running my own business, it is obvious that our focus on metrics caused us to stop focusing on the metrics that matter - metrics that define what "winning" is. Tomorrow, we'll go deeper into this topic. Today, please think for a moment ... what does "winning" mean to your company? Is your company "winning", and how would you know if your company is "winning"? Discuss. P.S. 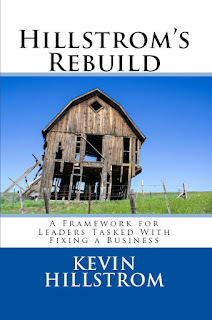 Click here to purchase Hillstrom's Rebuild on Amazon. In The Simulations, How Much Is The Customer Worth? When you run a Lifetime Value Simulation (#LTVS), you learn how much downstream demand customers generate. The curves frequently look similar to the curve depicted here - more downsteam demand happens in year one, then the rate of demand downstream flattens a bit. Cumm Through Year 1 = $59.36. Cumm Through Year 2 = $92.69. Cumm Through Year 3 = $121.69. Cumm Through Year 4 = $149.47. With the fitted relationship, we can estimate what happens even further down the road, right? Year 1 = Ad Cost of $12.00, Profit Factor = 35%. Year 2 = Ad Cost of $9.00, Profit Factor = 35%. Year 3 = Ad Cost of $7.00, Profit Factor = 35%. Year 4 = Ad Cost of $5.00, Profit Factor = 35%. This yields an annual view of Lifetime Value. Year 1 = $59.36*0.35 - $12.00 = $8.78. Year 2 = $33.33*0.35 - $9.00 = $2.67. Year 3 = $29.99*0.35 - $7.00 = $3.15. Year 4 = $27.78*0.35 - $5.00 = $4.72. And the annual view is translated to a cumulative view. Let's say you have your Paid Search program. You generate 100 clicks at a cost of $0.50 each - you obtain 2 orders at $40 each, with a 35% profit factor. Profit Factor = $80 * 0.35 = $28.00. Profit (Loss) per New Customer = ($22.00) / 2 = ($11.00). You lost $11.00 acquiring the customer (you measure Profit per New Customer and not Marketing Cost per New Customer ... right ... RIGHT?). It will take two years to make up the money you lost acquiring the customer. 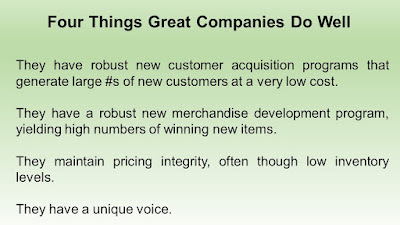 Do you acquire the customer? This is where you need your Five Year Customer Simulation ... taken down to variable profit. Do sales and profit meet the expectations of your Chief Financial Officer? If the answer is "yes", you acquire the customer. If the answer is "no", you don't. You need the Lifetime Value Simulation (#LTVS) to determine how much profit the customer generates downstream. You need the Five Year Customer Simulation to illustrate to your CFO how much demand and profit your strategies generate. You need the partnership of your CFO. And then, you can apply your tactics to all marketing channels and bask in your customer development brilliance.